The World Cup, the championship soccer series that decides which country is the best in the world, began yesterday (the 14th of June) in Russia. There is a bit of World Cup Fever going on in Poland. What do I mean by that? Well, there are various memorabilia or patriotic things for sale in the stores - red and white scarves, small flags, and other small trinkets people can buy to show their loyalty to the Polish team. 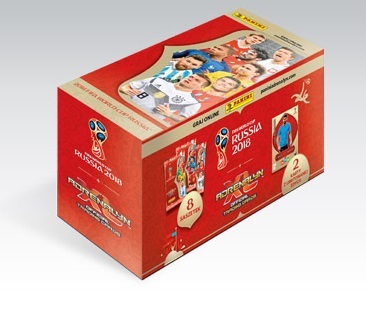 One store, Biedronka, is giving out footballer cards (like baseball cards, but with the soccer players on them instead of baseball players) and stickers so you can fill up a book with your memorabilia from it. Since Poland's flag's colors are red and white, it means we are seeing a lot of red and white around. Since my readers are mostly Americans - and to the average American, The World Cup doesn't mean much, let me educate you a tad bit. I'm not really a complete expert on it, but I've certainly learned a lot more by living here than I knew before we came! First of all, unlike the Olympics which lasts only 2 weeks, the World Cup will last just about a month. They have them 4 years apart, just like the Olympics. They schedule 3 matches a day. Typically a soccer or football (futbol) match lasts 90 minutes - 2, 45 minute halves. They don't stop for many things, but when they do have to, the refs keep track and add the time that they stopped (injuries, for example) and add it to the end of each half. It always seems a bit arbitrary to me, but maybe it isn't quite as bad as it looks to me. They play on a pitch, or a soccer field! I felt really stupid when I didn't know what a pitch was at first. I mean, I thought it was when someone throws a ball! :) Too much baseball/softball, I guess. The series will go on and teams will get points - 3 points for a win, 0 points for a loss and 1 point for a tie. They are grouped and will play each of the other teams in their groups. The winners from the groups will then play each other, and so on. They will also keep track of the numbers of goals each team gets and if necessary that number can help decide on a team's ranking-- they can use that to help break a tie. Poland won't play their first game until Tuesday - 5 pm our time. At that time all over Poland, televisions will be turned on and men especially, but not only, will have their eyes glued to the screen! We will be playing Senegal. On Sunday the 24th, we will play Columbia and then finally Japan on Thursday the 28th. At that point, we'll see where we stand in our group. If you are really interested, check out this link to the official FIFA website - to find out the latest. I've heard our team is good this year - I guess we'll see! Soccer is the biggest sport in the world - with more people playing it than any other single sport out there. This is really big! I know, it doesn't make the news much in the USA - but for the rest of the world, important things take a back seat to this event! I'll keep you posted on how Poland does! No matter whether or not you hate sports - if you need something for your project, be sure to check out what my sis has in the store! It's hard to describe this, but these red, orange and yellow patterns could resemble stems of leaves sitting on a pool of red water.